Here you can see my really old header images, my current and a sneak peek of my future one. 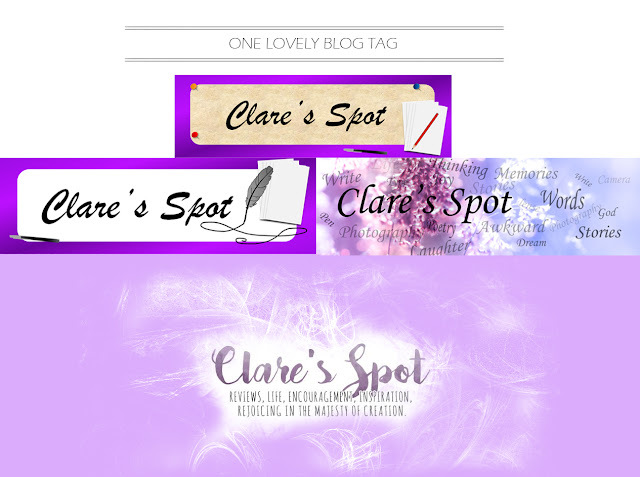 I got tagged for the Lovely Blog Tag quite a while ago; Thanks lovely Sarah from Ink and Paper Tall Ship. But I decided I really had to do this post today because my blog will be looking very different in a few days! Still I am sure it will be lovely, well I know it will be. My blog has changed a lot since I started it back at the beginning of 2013! The rules are simple: Give seven fun facts about yours truly, and then give this tag to fifteen other great blogs.... seriously 15, I think I shall have conveniently forgotten how to count by the end of this. A photo of mine was published in a newspaper. I think smelling books is perfectly normal. The first thing I ate this year was a plum. A photo that I took of my sisters was published on the front cover of a magazine. My sisters, cousin and I went and watched The Force Awakens. My sister, Alice, and I lead two young ladies Bible study/discipleship/BRIGHT Lights groups. I have first hand experience about how stupid sheep are, as of just the other day. I got a phone call for Clear Light Photography one day. Some random person wanted me to go out and take some photos of a mine half an hour away and then get them back to them before 5pm. They offered to pay me $250 for it too. I embarked on the mission. It turned into quite an adventure, and I even interviewed (yes, nothing to do with photography) the father of one of my friends who worked at the mine. I got home just before 5, but I still had to load the photos onto the computer and edit them and upload them. It was 5:30 by the time I had finished. Luckily it was partly their fault that it took me so long so they did not mind much and were pleased with the photo. The next day my photo appeared on page 4 of a newspaper. Annoyingly they all sold out that morning so I did not get a copy until a week or so later when a different friend's dad got hold of an old one from his work. So I think it is pretty cool that I got a photo in a big newspaper.... even if it looked heaps better on the computer than when it was printed..... but yes really cool! Smelling books is perfectly normal, and if you think it is weird, you shall just have to get over the fact that I do it.... a lot. I smell old books and breathe in the memories they carry. And I smell new books, fanning my face as I flick through pages so that the smell of ink and new, smooth paper scent the air with the promise of a good story. The first thing I ate this year was a plum. We were at a new year's eve party, and we had brought a plate of Christmas cake and plums. Shortly after 2016 arrived I decided to get home before we fell asleep but there were still two plums on the plate. So my sister and I ate them, and very tasty they were. A photo that I took of my sisters was published on the front cover of a magazine. Which is not particularly surprising. I have had some of my photos in every one for a while now, and I often write for them too. It is a small magazine for Christian ladies of every age. I would highly recommend subscribing to Shining Stars or even just following their blog on their website. Note: Links two above links are affiliate links. My sisters, cousin and I went and watched The Force Awakens. As you probably read about in my previous post. My sister Alice and I lead two young ladies, bible study/discipleship/BRIGHT Lights groups. You can read more about them on the Tomorrows Forefathers website. Well not so much them, but B.R.I.G.H.T. Lights groups in general. I have first hand experience about how stupid sheep (and me) are, as of just the other day. Never look after 6 sheep located in a small, electric fenced paddock that a creek runs through. At least not if it ever rains. Need I say more? Well it is a good story anyway so I will continue. I had thought of these facts the previous day and decided I should ask my mum if I should move them, but I forgot. Rain poured down, and the creek rose and rose. It changed from nothing to a trickle then a torrent that flooded over the flat next to it. The sheep decided they liked it more on the flat than on the hill near the gate on the other side of the creek. At the time of this event we had another homeschooling family staying with us and one of them accompanied my sister Jane and I on our mission to rescue the sheep. We sloshed up the road wearing rain jackets and gumboots. I fetched a bucket of sheep pellets which the sheep normally come running for, we figured they would follow me if I had them, but how wrong we were. First I switched off the electric fence and un-clipped the battery. Then undid part of the electric fence and we began to pull the fence up, so that it did not get washed away. As I mentioned the fence crossed the creek which was now a few meters wide and some of the posts was in the middle of the brown water. Our homeschooling friend; being a lot taller, stronger, and having higher boots than Jane or I managed to get out that post/fence holder up thing in the water. He continued around pulling up the posts, while Jane and I went around the long way. Rain still poured down. The electric wire lay slack on the ground but the sheep balked every time they came near it. Jane tried to herd them towards me but they stopped where the fence was every time. The our friend got to where we were and dragged the fence right out of the way and continued on. Now I hardly noticed the rain. I was in some ways glad of the wetness, because it at least kept the snakes hiding deep and the cold would make them slow too. Normally I would be afraid to walk around there for fear of the snakes that undoubtedly were just under the long bent over grass and piles of sticks and branches. Now those things did no more than cause us to stumble. The sheep still would not follow me. Eventually all three of us chased them over where the fence had been and they bolted off in the wrong direction. I managed to run around them and they turned. Together Jane and I herded them around the dam. But then they started up towards a different neighbor's place so I had to run again. I noticed the rain again. A long rain jacket and gumboots are not good for running in, and carrying a bucket (a small one) of sheep pellets only makes it worse. But I headed them off again. We now had them heading down a driveway back towards the road and the paddock where we wanted them. I followed slowly. But then the sheep for no apparent reason bolted, straight up the road. I began to run after them, but that only made them go faster. So I moved as far off to the side as I could (the side I did not want them to go on) I now stumbled along in the ditch, praying that the sheep would stop. A ute came down the hill while the sheep were still a fair way from it and the noise of that turned them into the un-fenced paddock next to where I wanted them. Prayers of thanks. I waited for Jane to catch up and staying well on the road side of the sheep I let Jane shoo them towards the front gate of our neighbor's yard. Then I sent her running back towards the creek to shut the bottom gate. The sheep had found the nice green lawn, but moved without to much reluctance when I shooed them towards the the gate to the paddock where I wanted them. After a moments indecision they followed the lead sheep through and I heaved a sigh of relief. I tipped out the bucket of food I had been carrying all the while and the sheep ran to me, brushing their wet wool on my already soaking trousers. Now they we not afraid of me........ Sheep. First of all I tag my cousin Jessica of the blog Inspiration, because now she does have a lovely looking blog!!! I admit it caused me pain before but now with its makeover it is indeed lovely. And Carissa from Delight in Joy, because the word lovely fits her blog so well. I also tag Cait of Paper Fury, because her blog design is lovely. And Sophie of The Techno Maid, because her blog looks lovely too. And last but not least my sister Jane at The Misty Mountains which does look nice at the moment, but hopefully it shall soon have a lovely new header. Have fun doing the tag. Clare Farrelly is a professional photographer. She is an Australian and lives in NSW Australia. In her free time she likes to read, do random crafts or sewing projects found on Pinterest, journal, write articles and stories. Most important, she is a daughter of the living God, saved by his grace. Congratulations on having your photos in both the newspaper and a magazine. Wow! That's impressive. I hope we can go see Force Awakens soon. We planned to go a couple of weeks ago, but it turned out that they had sold out. We still have to set another day to go. Thank you so much for tagging me for this tag! I hopefully will write this post soon. I hope you can get to go see The Force Awakens soon. I am sure you won't take as long as I normally do to do tags.. I am terrible are remembering. Hey Clare! It's Jade, from the camp a few months ago. Was it the Campbell family staying with you? They stayed with us too! Who helped you get the sheep? It sounds like you had a lot of fun!! I've been enjoying reading your blog - (found it through Pinterest!). My name, as you may have gathered, is Clare Farrelly. I am a self-employed photographer. As the eldest of six I spend a lot of time helping around the house, often listening to an audio book at the same time. I am an Australian and live in NSW Australia. Though I am a homeschool graduate, I am still studying a little and learning new things every day. In my free time I like to read, do random craft or sewing projects I found on Pinterest, journal, write articles and stories both short and really long. Most important of all, I am a daughter of the living God, saved by his grace.